There may be no better a place than Florida, with its stifling heat, nettlesome insects and aura of last-stand ambition, to set a play about four people grappling with issues of faith. “Grace,” a dark comedy now at the Cort Theatre, finds Steve (Paul Rudd) and wife Sara (Kate Arrington) relocated from Minnesota to the Sunshine State to pursue a real estate venture, Gospel-themed motels (motto: “Where would Jesus stay?”), that is obviously shaky. Steve saw his mother drop dead at 7 and along the way found God. He’s polished up his act, and feels ready to make his stand, obedient wife in tow. From the attention-grabbing outset (“Grace” makes deft use of an experimental time-structure) we’re left with a clear sense of how the plot will evolve. 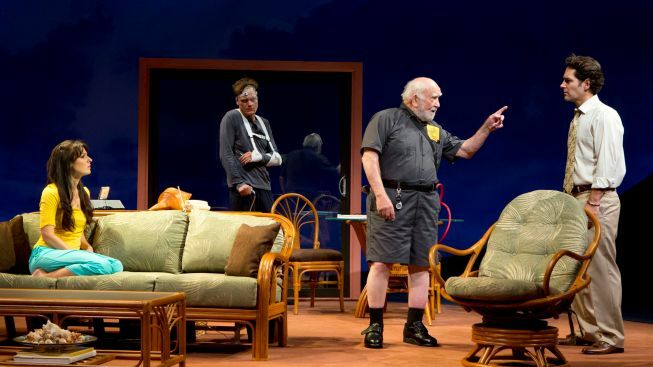 The “committed Christians” and their neighbor live in adjacent apartments, alternated between thanks to a clever rotating set by Beowulf Boritt. The action moves briskly (“Grace” clocks in at 100 minutes, without intermission), as Sara nurses a Mother Theresa complex toward the wounded rocket scientist that gradually grows more intense, and Steve’s religious fervor and misguided capitalist impulses give way to anxiety, desperation and jealousy. You might buy anything from Rudd (last seen on Broadway opposite Julia Roberts in “Three Days of Rain”), as the charismatic, overconfident evangelical. The zeal comes through as he shares good fiscal news with his wife: “Do you know what I can do now that I know ... the Lord really works this way? What I can achieve in the hotel industry?” It’s Steve who has the most to lose in the play’s present, and Rudd travels his deteriorating path with subtlety and surprise, clinging ever-more-loosely to the faith that has gotten him this far. Playwright Craig Wright (TV’s “Six Feet Under”), who has woven autobiographical elements of his own life into the story, starts out on safe footing, presenting alternate views of faith and asking provocative questions: Whose idea of God is “right”? Would God disrupt one man’s inspired wish to start a life for his family in this new promised land? Would God interrupt another’s life in so cruel a manner as to render him virtually incapable of leaving his apartment? Soon enough, we have our answers. Ultimately, “Grace” draws few bold conclusions about faith, but it wears its condescension toward organized religion like a billowy silk Cuban shirt. “Grace,” $32-$132, on sale, via Telecharge.com, by calling (212) 239-6200 or at the box office at the Cort Theatre, 138 West 48th Street.